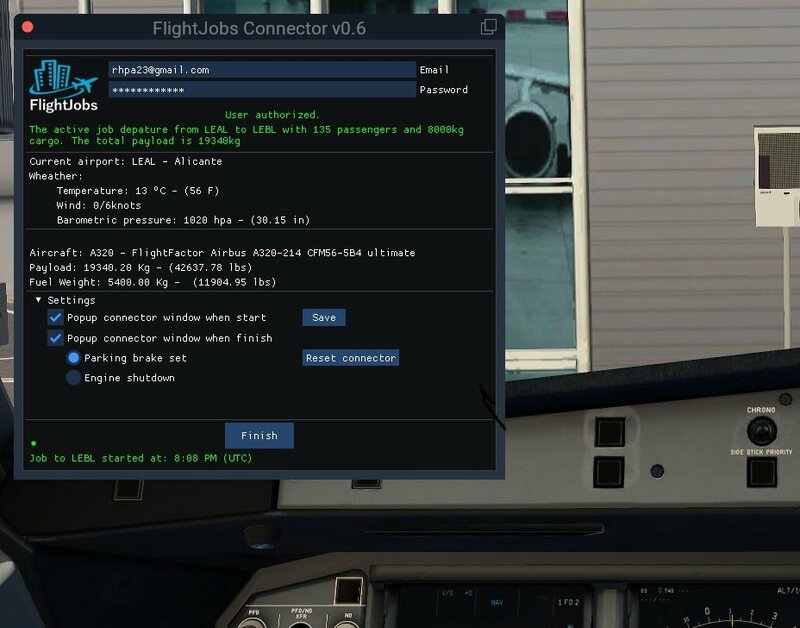 FlightJobs improve the X-Plane simulation experience from the point of view of the Pilots. Other similar tools place the user as an entrepreneur in aviation, buying aircraft and limiting their flights by type of aviation. The intention of FlightJobs is to simulate the pilot's work, earning money and experience to be hired by an airline company. [NEW] Airline ledger with all flights data generated by the airline jobs. Fees, taxes, and charges are generated with the jobs. [NEW] Destination and alternate tips. [NEW] Information about FlightJobs on Analysis page. You can't finish a job flight if you accelerate the sim time or change the aircraft location. The application will validate the arrival at the destination in a short time, based on the distance. No switch between pounds and kilograms for fuel loadout for flight. And to might want to save this as a switched choice in profile for permanently. So you don't have to keep switching every flight plan. Please fix thanks. The information is saved in a browser cookie but the permanently save in server side is on the roadmap. Released the new Connector version 0.6 was rewritten to work as Flywithlua script. Now works on Mac OS and Linux.